There are only three seasons in NYC: autumn, winter, and Smorgasburg, when the city’s best food trucks, restaurants, and chefs rally for six months of tasty bliss. Smorgasburg is one of the largest open-air markets in the nation, showcasing wild and eclectic eats at three locations around the city. Every vendor is carefully vetted, and no two dishes are alike. 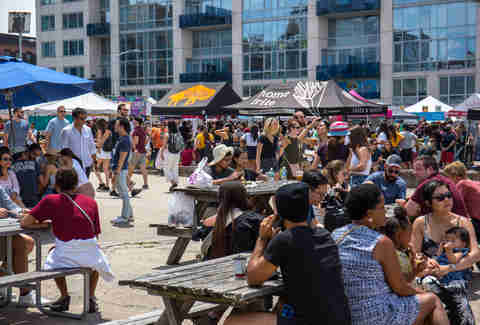 Smorgasburg 2019 kicks off on Saturday, April 6, and this year, there are a few changes to get excited about. 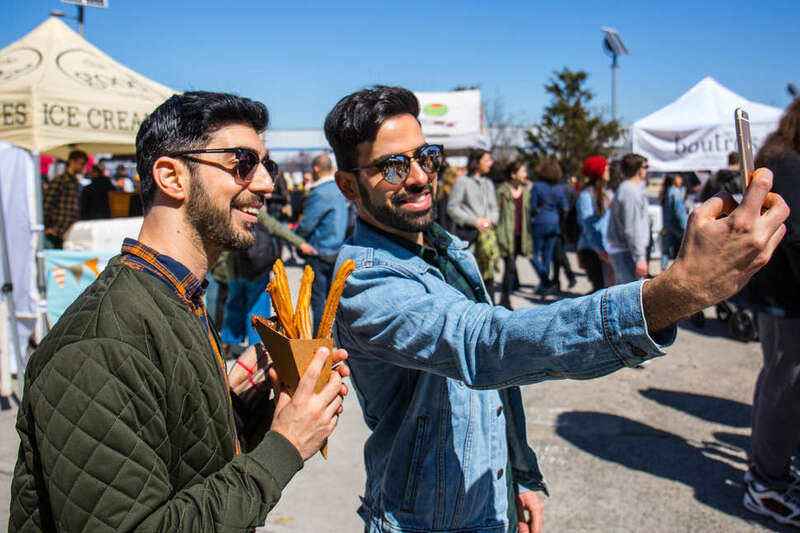 In addition to the first-ever Friday market in FiDi, 25 new vendors joined the Smorgasburg roster, and there are a few standouts worth looking out for. Here’s every new vendor you need to visit at Smorgasburg between now and October. When childhood friends from Vietnam, one a fashion entrepreneur and one a food scientist, come together to design extravagant frozen desserts, you can expect near-perfection. 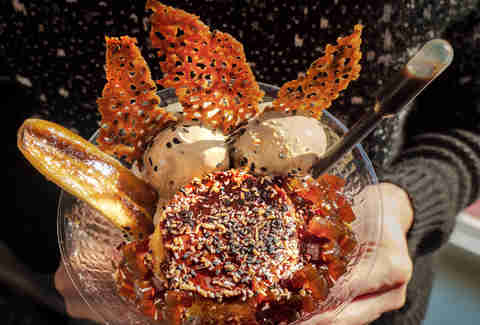 Kochin’s elaborate dessert “tornados” are equal parts sweet and refreshing, pairing scoops of homemade ice cream with natural ingredients common in Vietnamese and French cuisine. Choose between the fruit-forward Beauty Dose and the caffeine-forward Coffee Bomb, both Instagrammable in their own right. 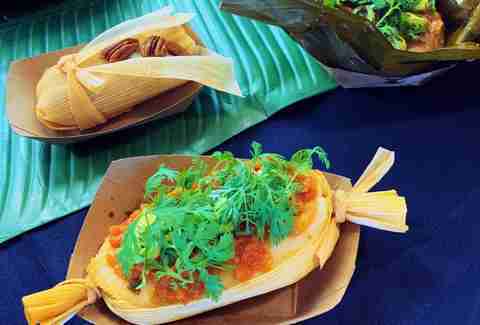 Three recent transplants from Venezuela partnered to bring some of the best of their native cuisine to New York City, now including Smorgasburg. 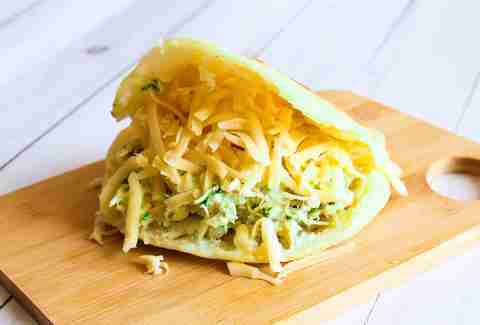 Their gluten-free arepas come topped with your choice of pork pernil, veggies, or cheese, and their perros calientes (hot dogs) come mantled with slaw, avocado, potato chips, and sauces. Nathan’s Famous could never. 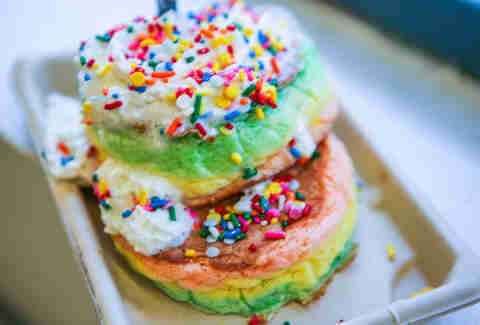 Fluffy breakfast foods will always reel people in, and among the several dozen vendor creations at Smorgasburg this year, Fluffy’s inflated soufflé pancakes are a likely show-stealer. The Japanese-style “fluffies” come in stacks of two, available in three different flavors: blueberry cheesecake, creme brulee, or original with butter and maple syrup. Bring a couple friends and try them all -- there’s no better place to indulge. Baked goods are the name of the game at Millers and Makers, run by a married couple who mills their own flour in Brooklyn. Breads and sweet treats lack some of the pizzazz found on other vendors’ menus, but simplicity speaks volumes when done correctly. The must-try item here is the sweet potato cinnamon roll. Prepare to be impressed. 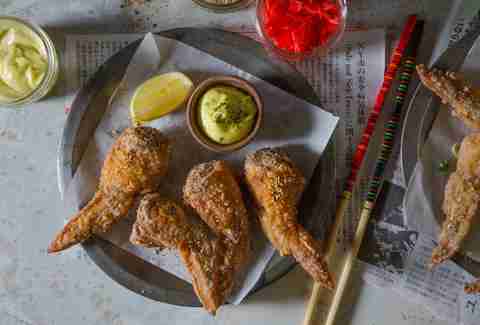 Count on fried chicken with a twist at Tori-San Japanese Fried Chicken, where beloved American dishes go for a makeover. Here, dumplings and fried chicken become one with pork scallion gyoza-stuffed wings, chicken & waffles are reinvented with okonomiyaki batter and karaage chicken thighs, and fried chicken sandwiches include yuzu slaw and Sriracha kewpie mayo. It’s the Japanese fusion you didn’t know you needed, and one you won’t soon forget. Everyone appreciates a healthy gut, but pungent probiotic drinks aren’t everyone’s cup of tea. The Better Pop makes kombucha more palatable -- tasty even -- by tossing whole fruit in the mix and freezing it into a popsicle. The grid-shaped treats are easy to bite, easy to share, and come 100% guilt-free. Nobody said you had to spoil your #YearOfWellness to enjoy a Smorgasburg Saturday. The Colombian chef behind La TropiKitchen brings Caribbean influences to her cooking, to vibrant, delicious effect. The housemade treats’ organic ingredients are evidenced by fresh flavors. She’ll have bollos de coco and pasteles on offer, but you’d be remiss to pass on the tamales. If you want to learn more about the chef’s travels and inspirations, take a look at La TropiKitchen’s blog. 10Below has been a titan of rolled ice cream in NYC since it first popped up in Chinatown in 2015. Now, just in time for Smorgasburg 2019, they’ve added the Ice Cream Blitz to the menu. 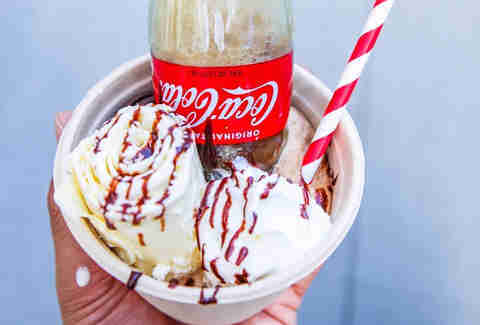 The Blitz is an ice cream float with flair: A mini Coke bottle rests upside down in the cup alongside Thai rolled ice cream, whipped cream, and chocolate drizzle; the higher you lift the bottle, the fizzier it gets. Regular ice cream bowls will also be available for the soda-averse. Nansense may be a new vendor, but its reputation precedes: The Afghan food truck won Best Rookie Vendor in the 2018 Vendy Awards, and it already warmed up to Smorgasburg audiences at this past season’s indoor winter market. 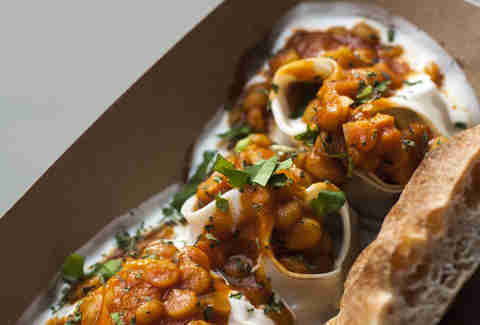 The chef will serve his take on Afghanistan comfort food in the form of curry dishes and Afghan dumplings; non-meat eaters can sample the vegetarian korma. 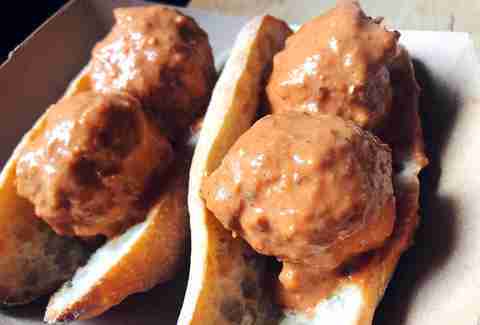 Let’s dodge the obvious pun here and say that Amazeballs’ meatballs are, uh, great. If you made the rounds at Smorgasburg in 2017, you may already be familiar with former NFL player Derrell Smith’s creations. But if not, you can get familiar now; after a one-year hiatus, Amazeballs is making its highly anticipated return. Order meatballs in a bowl or on a roll, vegan or regular, and toss on some unusual toppings like pineapple habanero sauce and potato chips. Kyler Alvord is a travel editorial assistant at Thrillist. Find him on Twitter and Instagram.